U16 boys footballers had an emphatic 4-13 to 0-3 point win in the first round of their championship v Kilmacud Crokes. St. Maurs 4..6 Naomh Olaf 4..3 What a brilliant performance from our U/14 camogie team as they travelled to Sandyford and came from 5 points behind to come away with the league points after a thrilling game. Another fine win for our Senior hurlers Sunday morning 1-12 to 1-06 over Crumlin. 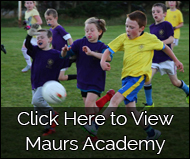 St. Maurs G4MO played their first match in a series of Round Robin games Sunday. They got off to a great start with an impressive win over Lucan Sarsfields. Well done all. Well done to Olivia Leonard of Dublin Ladies football team and Anna Goodey of Dub 16s ladies footballers both representing the Club at inter county level over the weekend. Some of the juveniles made the trip to Parnell Park Saturday evening. Despite the result, the kids, parents and mentors had a great night. Over 30 kids from the U8, U9, U10, U11 and U13 teams attended. The Under 14 girls took part in the Football FÃ©ile in Man 0'War. Thanks to their mentors, Graham and Dana, for all their hard work and to everyone involved in organizing the gorgeous new gear. U10 girls had their first camogie match of the year away to Clontarf. We played 6 won 3 lost 3 so not a bad day. 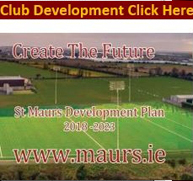 Maurs U14 footballers lost out to Clondalkin Round Towers at home on Saturday. Maurs U13 Footballers lost out away on Saturday to Oliver Plunketts and at home to Erins Isle on Sunday where they lost out by one points after a very tight game.